Montblanc was born from the idea of creating an ink pen which contained an integrated ink reservoir, making it ideal for travel. Indeed, it was this idea which led three men to form a company in 1906 with the express aim of creating such pens. In 1908, the convenience accorded by the pens provided the inspiration for the name of the company and the nomenclature ‘The Simplo Filler Pen Co.’ was chosen. However, only a year later the name ‘Montblanc’ emerged. The highest mountain in Europe provided a wonderful symbol for elevated craftsmanship and an inspired metaphor for the pinnacle of excellence. The snow-capped logo, with its six tongues representing the glaciers found on the famous mountain, has adorned luxurious writing instruments, premium leather goods and watches since 1913. The ‘Meisterstück’ fountain pen is arguably the most famous writing instrument ever produced, attracting iconic status. Its name means ‘masterpiece’ and with its black body and stylish gold accents, it has been much admired since its release in 1924. 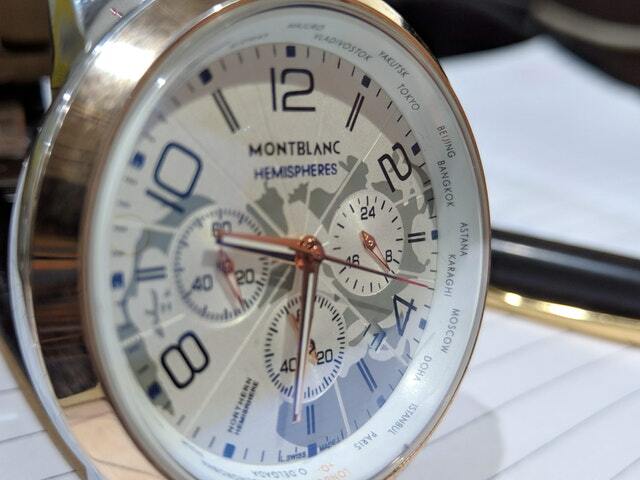 It was after the acquisition of Montblanc by luxury giant Richemont in 1993 that the company entered new market segments, including premium leather goods in 1995 and watches in 1997. While Hamburg has always been home to the manufacture of Montblanc’s writing instruments, the luxury brand looked to Switzerland to establish its watchmaking operations. In 1997, Montblanc Montre S. A. was established in Le Locle, a district of Switzerland, close to the French border and an area which has a long history of watchmaking excellence. The first Montblanc watches partnered gold cases with black dials, referencing the famous ‘Meisterstück’ pens. The brand went on to offer a broad range of models, including ladies’ watches incorporating quartz movements. Early models included chronographs using ETA calibres. Black DLC coated cases later featured on the company’s ‘Sport’ models; a trend which continues to prove popular on some Montblanc models of today. Minerva, based in Villeret, was a name held in the highest esteem with a rich history dating back to 1858. Richemont acquired this prestigious company in 2006 and later renamed it the ’Institute Minerva de Recherche en Haute Horlogerie’. The Minerva name has always been synonymous with chronographs and held in the highest esteem for its no-compromise finishing. Under the aegis of Montblanc, the manufacturer in Villeret has produced an incredibly diverse collection of models, including monopusher chronographs and tourbillons. The atelier even produces its own balance springs featuring Breguet overcoils. The volumes of watches produced in Villeret is very small owing to the high amount of hand applied techniques used. However, the site has provided a rich source of skills and knowledge which has proved beneficial to the site at Le Locle. In 2008, Montblanc began producing its Nicolas Rieussec chronographs in Le Locle. Monsieur Rieussec, a Parisian, created his time writer chronograph in 1921. The device was used to record the times of horses participating in races. The name chronograph is a combination of the Greek words for ‘time’ and ‘to write’, ‘chronos’ and ‘graphein’, respectively. Rieussec’s machine employed two rotating discs which revolved beneath an ink filled hand. Pressing a button released ink onto one of the dials indicating the elapsed period. The links to ink, as well as chronographs, a complication which Montblanc has wholeheartedly embraced, made Rieussec’s invention an ideal source of inspiration for the maison. While the Montblanc Nicolas Rieussec chronographs do not employ ink to record time, they feature two rotating discs with static hands as an alternative take on conventional chronograph registers. Montblanc has produced both hand-wound and self-winding manufacture calibres for its unusually styled models. The specification of these movements is particularly impressive, courtesy of the column-wheel chronographs and the mono-push operation of the stopwatch functions. The finishing of these models, whilst not as high as those found on the Villeret creations, is nevertheless very impressive with much effort expended on polishing parts the wearer will never see. The appointment of Jerome Lambert as CEO of Montblanc in the latter half of 2013 led to the release of numerous new models, many of which represented incredible value for money. The Heritage Meisterstück Collection, released in 2014, celebrated the 90th anniversary of the company’s legendary fountain pen and included several references. A perpetual calendar model, normally an expensive complication, evoked huge excitement when it was released with a comparatively modest asking price of £8,500 for the stainless steel version. While watchmaking has only been part of Montblanc’s history since 1997, it has become an increasingly important element of the company’s product portfolio. Despite its relative short time in watchmaking, Montblanc has displayed an impressive array of skills, evident when handling its timepieces. Today’s Montblanc collection ranges from affordable two-handed watches to ultra-complicated Villeret timepieces with six-figure price tags, highlighting the breathtaking choice the company now offers. Browse Blowers’ selection of Montblanc watches online today.